Dubai is a land of superlatives – it has the world’s tallest building in the 830m, 160-storey Burj Khalifa, and one of the world’s largest shopping malls in the Dubai mall. The sail-shaped Burj Al Arab is the world’s first seven-star hotel, while the man-made Palm Islands development is a unique and iconic piece of real estate recognized the world over. Fast becoming the world’s crossroads, Dubai, the most populous of the United Arab Emirates is well-established as the leading financial centre in the region. It is also home to luxury yachts and supercars, world class theme parks, as well as everything from desert safaris and dhow trips to the Middle East’s only indoor ski slope and the Miracle Garden, the world’s largest natural flower garden, with over 50 million flowers and 250 million plants. And just as Dubai is a unique destination, both within the Middle East and globally, so our Middle East operation has its own unique place within the Lumi family. Launched in 2018, Lumi Middle East has been busy building awareness of our brand and products within the region, establishing relationships and partnerships with local regulators and financial markets. 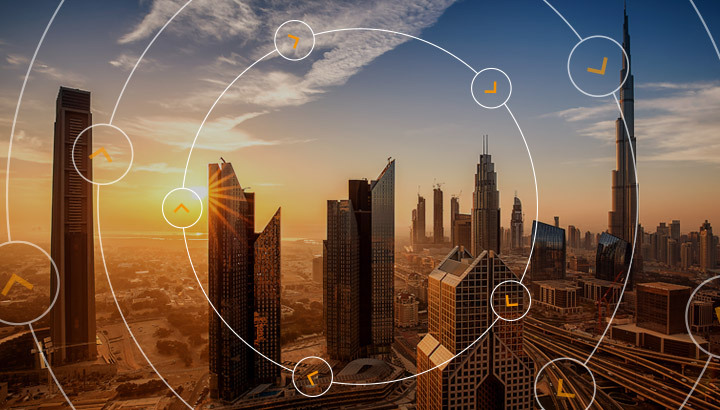 Our initial focus is on Dubai, but once we are successfully established more widely in the UAE, we will expand to other GCC countries and the rest of the Middle East, and take our place as one of the key contributors to Lumi Global’s ongoing success. The bedrock of our success is our End to End AGM Solution, which helps you to improve your annual general meeting from pre-event preparation through the meeting itself and right through to post-event reporting and analysis. As you know, successful meetings don’t just happen. They require a lot of preparation. We can help with all of the steps you need to take to make sure your meeting is a success, starting with choosing the right venue and booking it. We can help you design your AGM notice invitation, the necessary newspaper advertisements, your annual report and all the market collaterals and branding that you need. We will not only print your annual report and all the event collaterals, but also any invitation notices and distribute them by mail and courier as well as informing any official gazettes that need to be notified. We will also generate PDF invitation notices with individual and bulk search options enabled. At the venue, we will set up all your audio, video and translation services, and have a rehearsal before the meeting to ensure that everything is fully operational. We will contact shareholders to tell them when and where the meeting will be held and we will create an online registration system for you. Our new platform allows attendees to log in and cast their votes electronically in advance of the meeting, for a time period that you decide. Only authenticated members can access the Pre-Voting platform. There are a wide variety of benefits to utilizing the Pre-Vote platform including greater accessibility, and provides a seamless transition between Pre-Voting periods and meeting days. We will also have a VIP registration desk in place to ensure your most important guests are processed quickly and efficiently. We will authenticate all shareholders and proxies, and we will ensure that they have everything they need to be able to take part in any votes. The registration process will be live-tracked and monitored using tablets. Alongside this, our kiosk voting stations will be available to handle the elections for the Board of Directors, allowing eligible attendees to cast their votes in a highly secured environment. Once the meeting is under-way, we will manage audience and shareholder engagement, including Q&A sessions, both online and in the room through the use of our handset devices and audio system. Our technology enables the creation of customized instant voting results and real-time management reports. Once the meeting is completed, we produce attendance, resolution and election reports, log reports, and audio and video recordings of proceedings, and we offer an archiving service to store all the details of the meeting. Lumi’s End to End Solution takes the pain out of organizing an AGM by helping you manage everything involved in your annual meeting, from choosing your venue to filing your post-meeting reports. If you would like to discuss how our Middle East team can help streamline your AGM, contact us here.